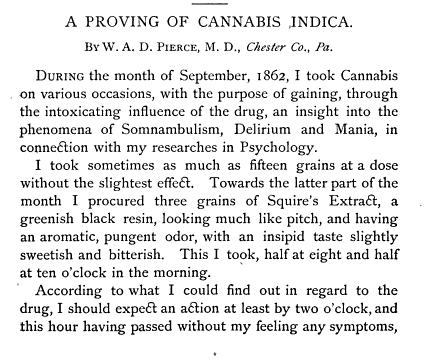 “During the month of September, 1862, I took Cannabis on various occasions,” confessed Dr. W. A. D. Pierce in the pages of American Journal of Homoeopathic Materia Medica and Record of Medical Science nearly a decade later. He did so “with the purpose of gaining, through the intoxicating influence of the drug, an insight into the phenomena of Somnambulism, Delirium and Mania, in connection with my researches in Psychology.” Pierce was not alone. Following the formal introduction of cannabis to American medicine in 1840, medical journals were filled with pages and articles recounting the self-administration and experimentation of physicians and their patients. Indeed, while autobiographical accounts of drug use like De Qunicy’s Confessions of an English Opium-Eater or Fitz Hugh Ludlow’s The Hasheesh Eater: Being Passages from the Life of a Pythagorean often garner the most attention on the matter, medical doctors were often experimenters themselves – especially when it came to cannabis. Personal experimentation with cannabis, like this one from Dr. Pierce, was common among physicians in the late nineteenth century.